Mango chutney recipes abound, and in my long experience of seeing Show entries, they are the most closely guarded within families of any recipes, particularly in Queensland! 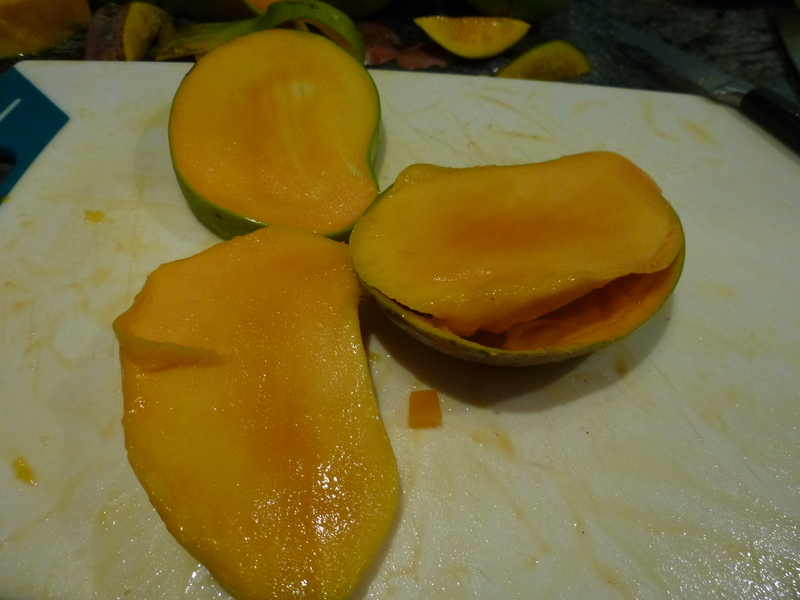 So many of us have mango trees in the backyard, and recipes are handed down through the generations. Mango chutney is the chutney I mainly remember my mother making, but sadly the recipe died with her over 30 years ago. The recipe I am using here is adapted from one of my cookery heroes, Miss Amy Schauer. Miss Schauer was a big figure in my childhood, with her Schauer Cookery Book, Improved Eighth Edition, 1939, figuring large in my kitchen escapades, and everything I cooked as a child (ie cakes) came from the book. It was not only my mother’s favourite cook book, it was her only cookbook. When I last counted a long time ago, I had over 300 cookbooks, and I had to stop collecting them in the same quantity, mainly for space reasons. How much things have changed! I was particularly impressed as a child that Miss Schauer had “graciously consented to the reproduction of her photograph” in that edition. She was a very kindly looking lady, and I looked at her often. The fact that this was my mother’s only cookery book (at least that I recall) puts into context that I spilt water on the pages as a little girl, causing a subsequent deterioration, which meant it hasn’t aged well. I still feel guilty about that. For my mother and Miss Schauer. Hopefully I have redeemed myself by now, but I still well remember how awful I felt to have damaged the book, and how cross my mother was! But back to the mango chutney recipe, which I have adapted from another of Miss Schauer’s wonderful works, The Schauer Fruit Preserving Book, no date, but around the 60’s or 70’s. You can still pick up a copy of this small paperback at a second hand store or Lifeline Bookfest if you are lucky. 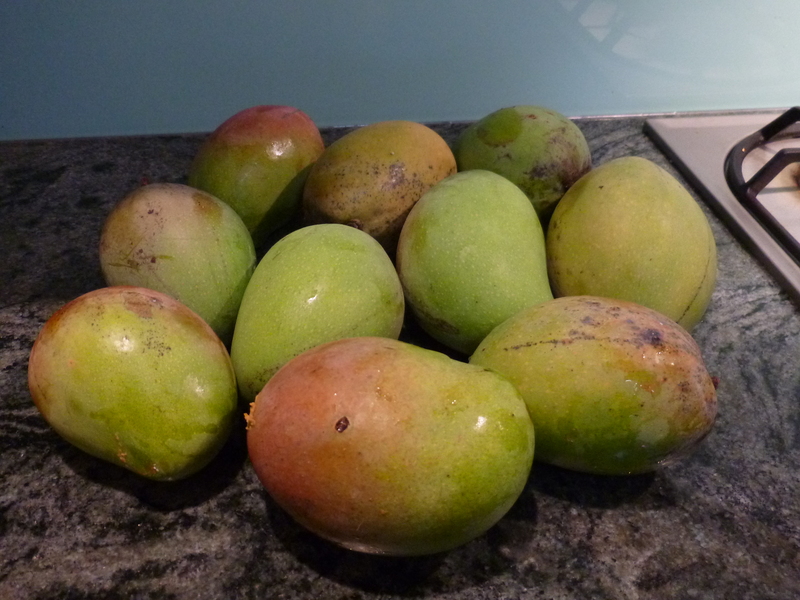 The original recipe specifies 24 green mangos, but the mangos of the time must have been significantly smaller than my R2E2 and Kensington Pride giants from the backyard from trees that are from recent breeding stock. I used around ten, as you can see from the photo. 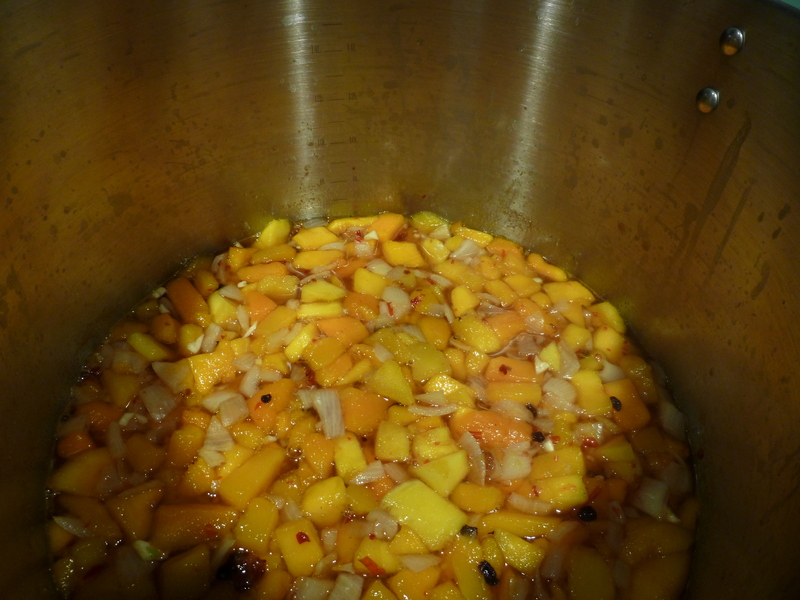 Mango chutney recipes are necessarily vague, as they are often used (at least in my case! ), to use up excess mangos from the backyard, or from a tray which we can often buy in Queensland, so you can vary the recipe a little. 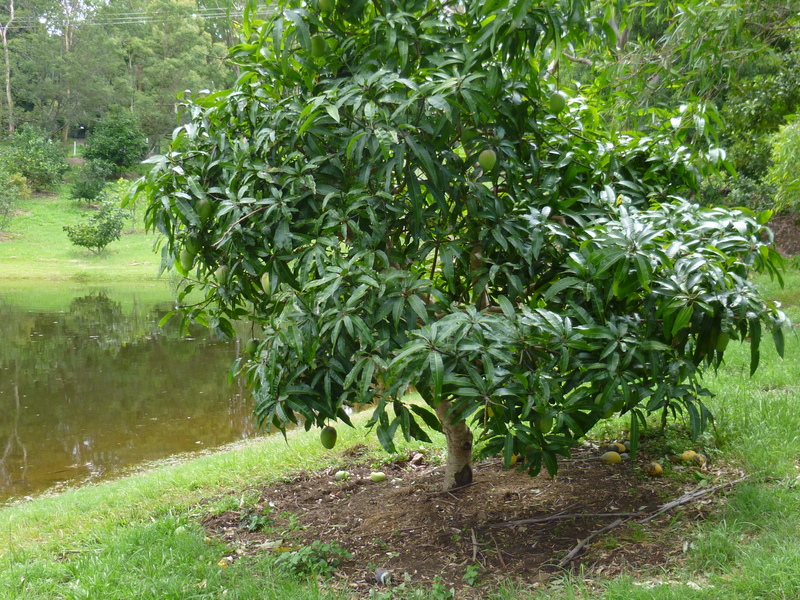 – Mangos – around 8-10 green, verging on ripe if possible. Remove the skins, and slice the mango flesh from the stones, and chop into dice. – around 350- 500 g of raisins or sultanas; I used up the rest of two packets of raisins and currents which I had on hand, leftover from Christmas. Sunbeam is the best brand if you can get it. 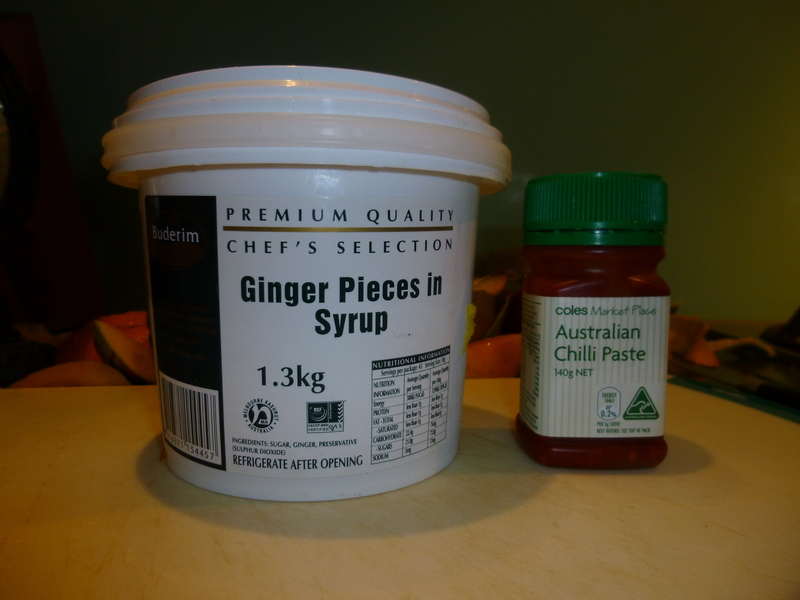 – ginger – here preserved is best, and one of my favourite products is a big tub of Buderim Ginger preserved ginger in syrup, which makes fantastic jams and chutneys; use a few good heaped tablespoons, chopped finely. If you can’t get this, you can often buy a similar product in the shops, or you can use a quantity of fresh ginger, grated or chopped or even a good tablespoon of powdered. – one bottle of vinegar – I used a 2 litre bottle of apple cider vinegar. Here opinions differ on using a white wine vinegar or malt. I like the apple cider vinegar, but it depends what I have on hand. In my Mother’s day you used plain old white vinegar or malt vinegar most of the time, depending on the recipe. – the original recipe said 2 ounces of salt, which is around 60 grams. Salt is important for preservation, so you do need to use around this amount for preservation and for flavour, as frightening as it appears to modern readers! 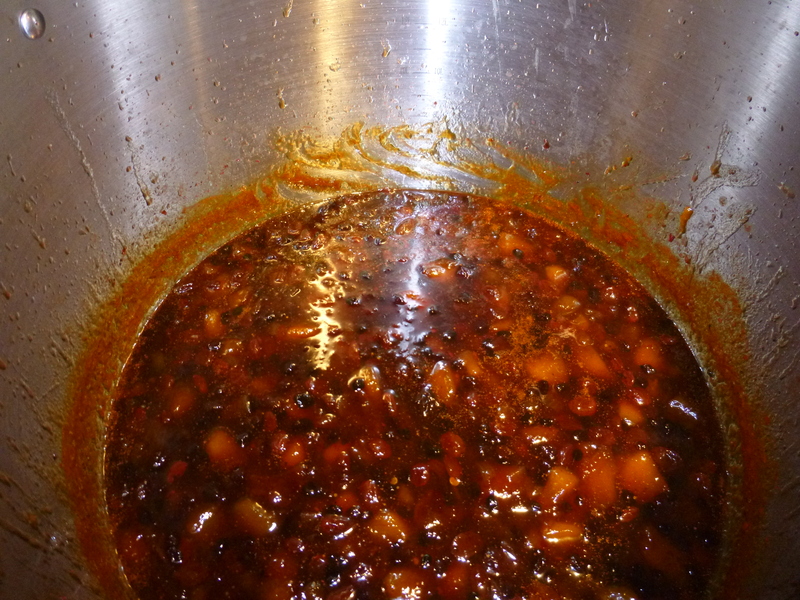 Boil all of the ingredients for around 1 1/2 – 2 hours until it reaches a thick, chutney like consistency, but remember that it will thicken once it cools. Chutney has a nasty tendency to stick very badly at the end and burn on the bottom, so be careful! If this happens, don’t scrape it up with the spoon and stir it in; you can save the chutney by pouring it off. It should look something like this at the end. 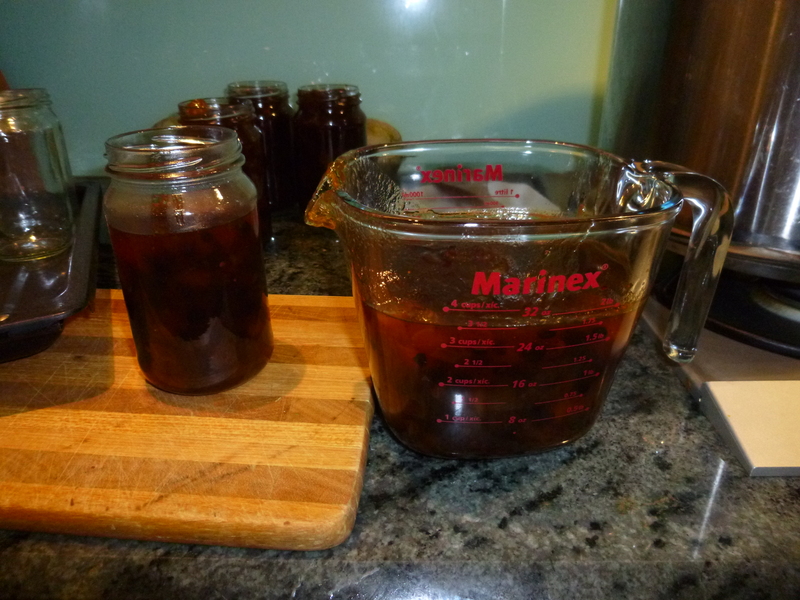 Pour into sterilised, heated jars, and immediately put the lids on. This recipe made ten 500 gram jars. While chutney improves with age, be careful in a hot humid climate, and store preserves in the fridge where possible. Always store in the fridge after opening.